The shiitake mushroom is a very popular mushroom among food lovers for its deep and smoky delicious flavor. But this mushroom is not just tasty but also very healthy. As a matter of fact it has been used by the ancient Chinese as medicine for almost 6000 years, now that’s a very long time and only further proves the value of shiitake mushroom as a medicine. These mushrooms are very healthy. You are about to read the detailed description of health benefits of the shiitake mushroom. If you want to grow mushroom , you can read this too: How to Grow Shitake Mushrooms. 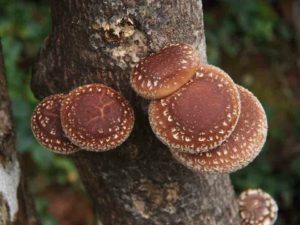 You can also grow them using shiitake mushroom growing kit. Fight obesity: Obesity is a medical condition in which body fat is too high of a percentage of your weight, and it has an adverse effect on the body. Being obese can cause a lot of problems, and eating shiitake mushrooms can help prevents that. Too much fat can lead to many diseases such as heart diseases, diabetes and sometimes even cancer. It also affects people financially by interfering with work and increasing medical expenses. It also slows people down costing them time and money. Eating shiitake mushrooms are an easy and inexpensive way to get rid of fat and stay healthy. Support immune function: the shiitake mushroom helps the immune function. The immune function is a host defense system comprising many biological structures and processes within an organism that protect against disease. Without it, we have no defense against sickness or diseases. It’s crucial to keep the immune function healthy and strong. A weak immune system function can cause constant sickness like colds, allergies, diarrhea, frequent headaches, and vomiting, etc. And that can cause serious harm especially if you want to live a healthy life. Eating shiitake mushrooms can help make your immune system function correctly. Anti-cancer support: Another health benefit of Shiitake mushroom is that it can help prevent cancer. Many researchers have shown that incorporating shiitake mushrooms in the diet help prevent cancer especially, prostate cancer, breast cancer, and colon cancer. Cancer is still one of the most deadly diseases with still almost no cure in sight. It’s paramount to eat foods that help prevent cancer, and the shiitake mushroom is one of them. Lower cholesterol: The shiitake mushroom can help lower your cholesterol levels. Having high cholesterol levels are not good for your body as it can cause heart disease and worst of all it can cause a heart attack or heart failure which many times can lead to death. As someone who has lost a loved one to a heart attack, it needs no further explanation as to why having high cholesterol levels are extremely dangerous. It’s crucial to lowering your cholesterol levels and eating shiitake mushroom can help you do that. Support cardiovascular health: The shiitake mushroom can keep your heart healthy and support your cardiovascular health. Keeping the heart healthy is essential; heart disease is the number 1 cause of death globally. Almost 17.3 million or more people die of heart disease every year in the world. These conditions include diabetes, stroke, heart attack, etc. Keeping the heart healthy is difficult, but shiitake mushroom can help you do that. Contain antimicrobial properties: The shiitake mushroom contains antimicrobial properties. Antimicrobial is an agent that kills microorganisms or inhibits their growth and help stop many diseases. And it works to keep the body healthy. Boost energy and brain function: The shiitake mushroom can improve our energy, and it can help prevent depression. It helps you be more energetic in your work, and it also helps your brain function better. It can boost your memory and improve other brain related work. Provide Vitamin D: Vitamin d is a crucial vitamin that helps you fight depression, helps with weight loss and makes your bones strong and healthy. And the shiitake mushroom is a good source of dietary Vitamin D.
B-Complex Vitamins: The shiitake mushroom also contains Vitamin B Complex. It relieves stress, strengthens your immune system, improves your blood and has many other health benefits. Improve skin health: Because the shiitake mushrooms contain Vitamin D, it helps keep your skin very healthy. It also slows down skin aging and also has many other skin related benefits. So, these are some fantastic health benefits of shiitake mushroom that can surely make you more health conscious.